Recycled Rita: Shabby Apple Giveaway! 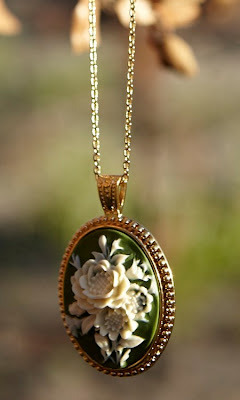 I am a lucky blogger to be able to offer my dear readers a jewelry giveaway from the wonderful Shabby Apple! If you have never visited their site, you need to! They have the most beautiful women's dresses and accessories and little girls dresses at www.shabbyapple.com. It is just so pretty and feminine! * Go visit the Shabby Apple shop and drool , ummm I mean, come back and tell me what you love in their store..... I bet you will find many things! * " Like" Shabby Apple on Facebook and come back and tell me you did it. * Become a follower of my blog (I just added that gadget! I need friends! I am such a computer dork!) and come back and tell me! So....there you go! Three ways to win this amazing piece of jewelry! But! If you don't want to join in.....or you just have to have that lovely white dress they are also offering a coupon to my readers. The coupon code is: recycledrita10off and it will expire in 30 days. The winner will be picked next friday, July 15th...I can't wait to hear from you!!!! Have a great weekend! 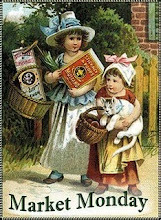 I will be back with some fun vintage finds! Love their things I saw a lot of pretty dresses on their site. Love the necklace you will be giving away too. I have already followed your blog for a long while but added myself to your friend connect. 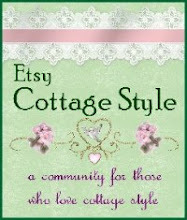 I LOVE Shabby Apple, thanks for letting me know about this giveaway, you are a sweetie! However, I can't decide (not unusual!) I love it all! And I'm a new follower of you........:). I love the Cecily skirt, but I've also been coveting Lost in Wonderland for some time! The Terchino necklace is one of my favs! I love Shabby Apple..just gave a dress away on my blog..I want all their stuff! Thanks for the chance at winning something for myself- my fingers will be crossed! 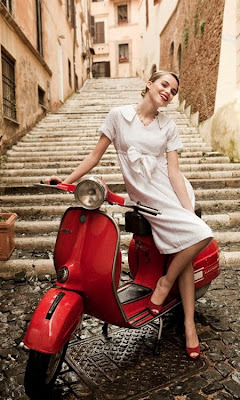 I love their Palatine Hill dress! And finally, I've become a follower of your blog. Woot, woot. Cute stuff! I liked the Fontana earrings - I don't wear much jewelry. Just earrings usually. I love their Pina Colada dress! Thanks for letting us know! I hope you're having a great day!! Wow Karen, you look great modeling the blue dress and the white dress-but please be careful on your boat and scooter, and wear your helmet and life jacket. Thanks for adding the Google Friends connect- it will make it easier for me to keep up with you on that scooter.